The Elder Scrolls V: Skyrim - The Skyrim Library, Vol. 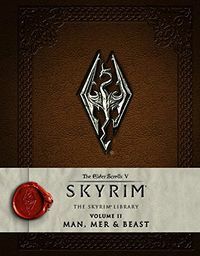 2: Man, Mer and Beast is the second of three volumes in the Elder Scrolls V: Skyrim - The Skyrim Library series, which is a printed version of many lorebooks from the game, paired with concept art. It was released March 15, 2016. The Nightingales: Fact or Fiction?